Opening Day of Boating Season! Wow! It’s hard to believe that Opening Day of boating season is just around the corner. Traditionally, opening day is celebrated on the first Saturday in May. In 2010, that's this coming Saturday, May 1. However, you'll see boat traffic through the locks increase all week as boaters make their way to the lakes & ship canal. Seattle has a rich maritime tradition; opening day is to boating what robins are to spring. Now is the time to pull your boat out and get it ready for another exciting season on the water. If you visit the locks you’re sure to see hundreds of boats making the passage. Many of these boats are on their way to cheer on their favorite team at the Windermere Cup races held in the Montlake Cut. If you’ve never experienced this special day you should make plans. It’s hard to imagine a better place to see a race up close where you can see the strain as each rower gives their all. Below is a slideshow of some pictures of boats through the locks and ship canal. 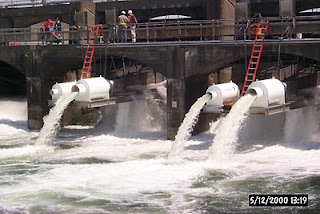 Ever wonder what those big white metal tubes were on the spillway dam at the Locks? Read on. The Corps of Engineers has installed those tubes; they are smolt flumes designed to help juvenile salmon safely bypass the Locks on their migration out to the ocean. 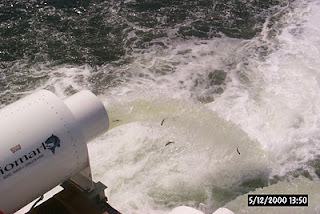 Studies had shown that smolts (juvenile salmon) were having a difficult time going through the Locks, which is their only passageway from the Lake Washington basin out to Puget Sound. Fish would get injured or killed when pulled into the filling tunnels or going over the spillway dam. In 1995 a prototype flume was installed to determine their feasibility, when deemed successful the current models were built at the Puget Sound Naval Shipyard and installed in May 2000. The 4 flumes are different sizes to better regulate the outflow of water from the freshwater lakes. The narrow outer ends of the tubes contain an electronic screen to read the PIT tags that are implanted in some of the smolts. PIT is "passive integrated transponder," a microchip type of tracking device. Standing on the spillway dam late April to early July you may see dozens of small (4"-6") fish shooting out of the flumes with the water, these are the sockeye, chinook and coho smolts headed out to the ocean. What looks to us like a dizzying fall is "just another waterfall" to a smolt and is actually safer than going through the Locks. The cords strung across the spill basin help increase smolt survival by detering seagulls from diving down to feast on the young fish. The smolts remain in the lower basin area for a few weeks acclimating, feeding and growing before they continue their journey to the Pacific. The term smolt comes from the word "smoltification" which is the biological process the juvenile fish go through which enables them to make the transition from fresh to salt water. For more info, check out the USACE release on the installation of the smolt flumes. Note: The fish ladder will be closed June 1-11 for its annual cleaning in preparation for the return of the salmon. Stay tuned!